College coaching rivalries are some of the most enduring in all of sports, and there are plenty of compelling and useful questions to ask coaches about each other. 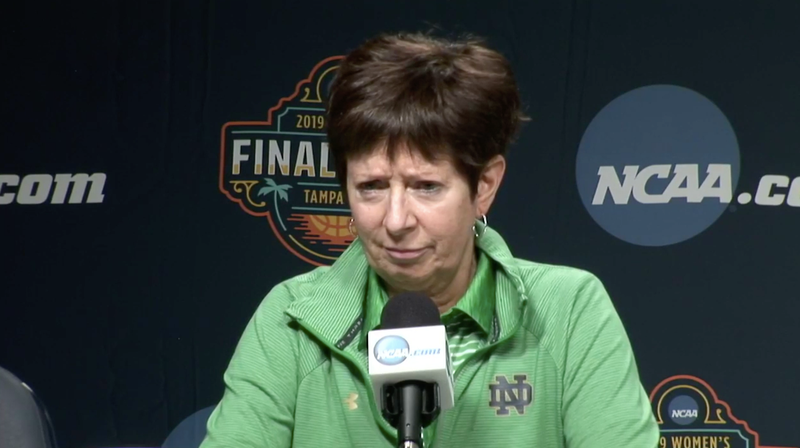 At the press conferences ahead of the women’s Final Four in Tampa, Florida, a reporter gave a masterclass in how not to ask about coaching rivalries, when he asked Notre Dame coach Muffet McGraw a very odd question about her hypothetical friendship/romantic relationship with UConn’s Geno Auriemma. “You think Tom Izzo has to deal with this crap? [Laugher] I don’t think so. I don’t think Coach K has ever been asked a question like that at the Final Four. I don’t think Dean Smith or anybody else has ever been asked a question like that. I appreciate you asking it, Charlie, but I think that the issue around women’s basketball, to me, that I find a little bit disconcerting is the attention is always taken away from the game and the players and it’s turned on to the personalities involved, of the coaches. And especially, God forbid, if one coach is a man and the other coach is a woman, then there always has to be some kind friction, tension and all that other stuff. And I wouldn’t marry me either, so what’s the big deal? And I know me better than anybody else knows me. UConn and Notre Dame tip off tomorrow at 9:00 p.m. ET.